After the last three years of working with dogs in various capacities – from fostering, to sheltering, to training – it sort of surprises me to say that training with my clients have been some of my most rewarding experiences. 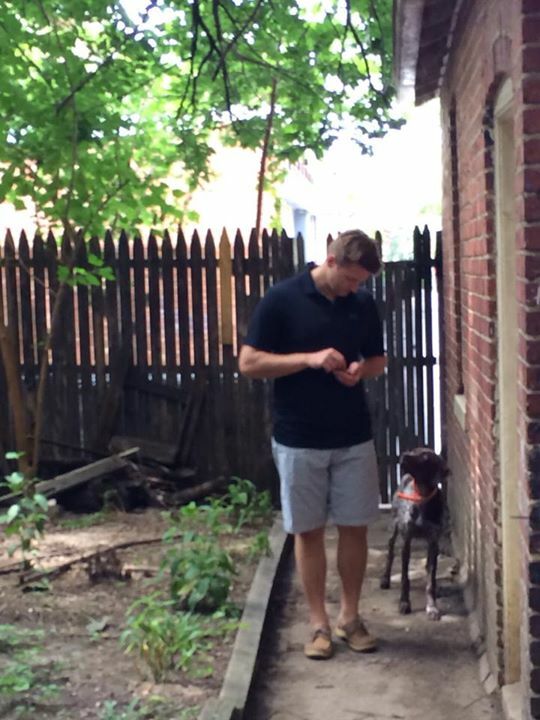 There is no better feeling than watching an owner’s relationship with their dog improve once they learn how to communicate with them in a positive way. 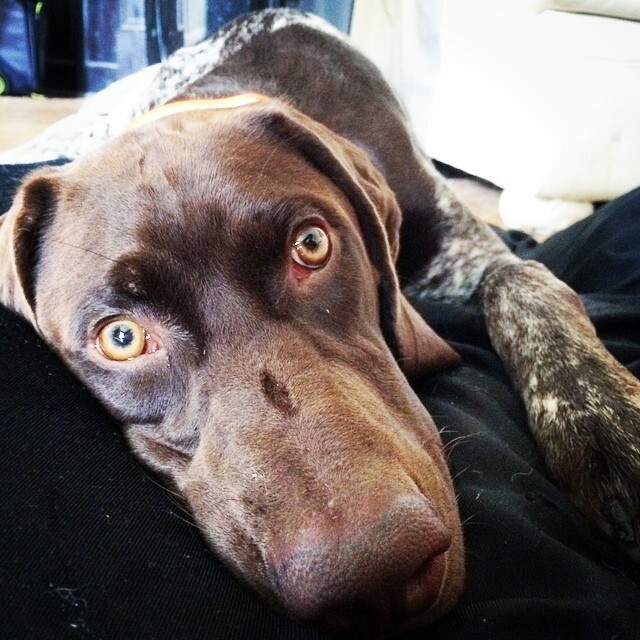 I’ve recently had an exceptionally rewarding ongoing journey with a dog named Jackson. 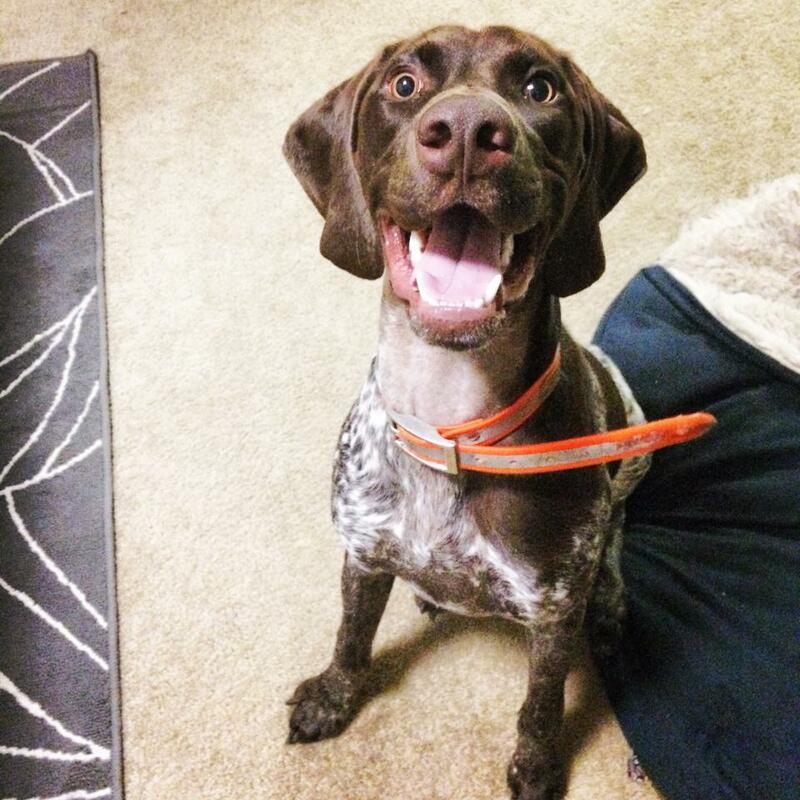 Jackson the GSP. His smile matches his energy and enthusiasm for life. 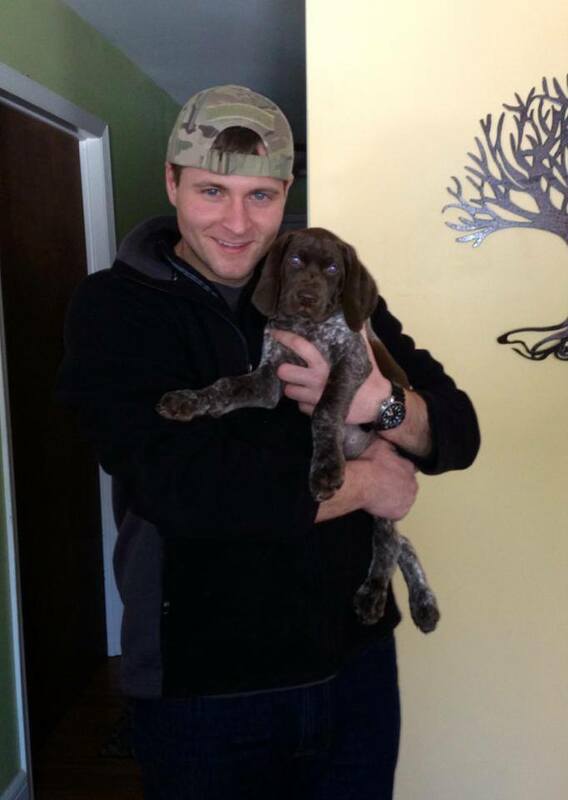 A while back, a friend from college mentioned to me that he was getting a German Shorthaired Pointer puppy to hunt with. I wished him luck (because really, a working puppy? No thanks!) and forgot all about it. Once my friend Bryan brought Jackson home, I got a text message here and there asking for basic advice, but not much more than that. Finally when Jackson was about seven months old, Bryan asked if I’d stop by to help with some training. Now I don’t know much about hunting dogs, but I do know they’re trained with aversives. This means the trainers use positive punishment (add something unpleasant to decrease a behavior) and negative reinforcement (remove something unpleasant to increase a behavior). I explained to Bryan that I use entirely force-free methods, and in fact use a lot of treats when I train, and that a lot of that probably wouldn’t fit with what he’d be learning out “in the field” as they call it in the hunting world. To my surprise, Bryan was still open to it. He did tell me though that he didn’t want to use a clicker because he didn’t want to have to carry it with him forever. I explained that’s actually not how it works but we’d talk more when I stopped by. The first few times I visited Jackson and Bryan were great. It’s quite evident how brilliant Jackson is, as he mastered sit, down, touch, “go to mat” and a decent recall almost immediately. Bryan and I had a lot of great discussions about training: why we use a marker signal, how to motivate Jackson in a way that will keep up with his natural instincts, why punishment isn’t the way to go for the type of relationship Bryan wants with his dog, why a high rate of reinforcement is important to keep Jackson engaged, how to break down behaviors so that Jackson fully understands them and more. I showed up the second week to Bryan using the clicker. I was thrilled, Bryan seemed pretty happy, and Jackson was enjoying training. After three of four weeks of visits, it became clear that using entirely positive training at home but still doing “traditional training” in the field would be too confusing for Jackson. An example of one training exercise gun dogs trainers use is a “force fetch.” This means applying a painful stimulus to the dog – for example, pinching their ear or pressing a dowel between the dog’s toes and using a cord to compress them – and then releasing that stimulus when the dog puts the object in its mouth. The dog learns that it can cause the pain to end by picking up the object. Another common practice for gun dogs are electronic shock collars. A shock is administered to the dog to get a change in behavior and the shock stops when the desired behavior is completed or the undesired behavior ends. The training we do with Jackson at home using rewards encourages him to be an engaged, participatory learner. We often want him to offer behaviors in an effort to find what gets him a reinforcer (this is called shaping and capturing). Our training teaches Jackson that good things can happen at any time, and that he can trust us to never use pain or fear if he messes up. Aversives teach the opposite. “Don’t mess up, or else.” Aversives are proven to slow learning because the dog is worried to try something new for fear of being punished. Ultimately this means that the trust we build with Jackson at home would be completely broken when he goes out to hunt, hindering his progress across the board. Upon realizing it couldn’t be done both ways, we started brainstorming on how to teach hunting skills using force-free methods. It uncovered an enormous learning curve for me because there are so many technical skills and technical names for those skills associated with a really great gun dog. Plus, these skills can’t be taught haphazardly – hunting dogs need to be fluent in all their cues under intense distraction and at a variety of different locations and distances. If you’re ever taught your dog literally anything, you know how difficult that can be. Luckily at the Karen Pryor Academy we mastered the skills behind teaching clean, reliable behaviors, so Bryan and I got right to work – he brought the hunting knowledge and I brought the training knowledge. I’ve also immersed myself in books (Positive Gun Dogs is my favorite at the moment), Facebook Pages and Yahoo listservs for positive gun dog training. It has been hugely encouraging to see Jackson’s progress over the last six weeks, especially given that he spent seven months doing pretty much whatever he wanted. Bryan and Jackson are up against a lot in their sport, but Bryan has stepped up as Jackson’s advocate and overall the tides do seem to be chaining, albeit slowly. Bryan said last time he showed up to hunting training with his clicker some of the other guys said they knew people who trained their dogs that way. It might be a while before traditional training is eliminated from dog sports all together, but I am hopeful that Jackson will soon be a shining example of what a gun dog can be when trained positively. Regardless, he will have helped me gain another skill set as a trainer that I can use in my career, enabling me to help more dog and owner teams in a new way. 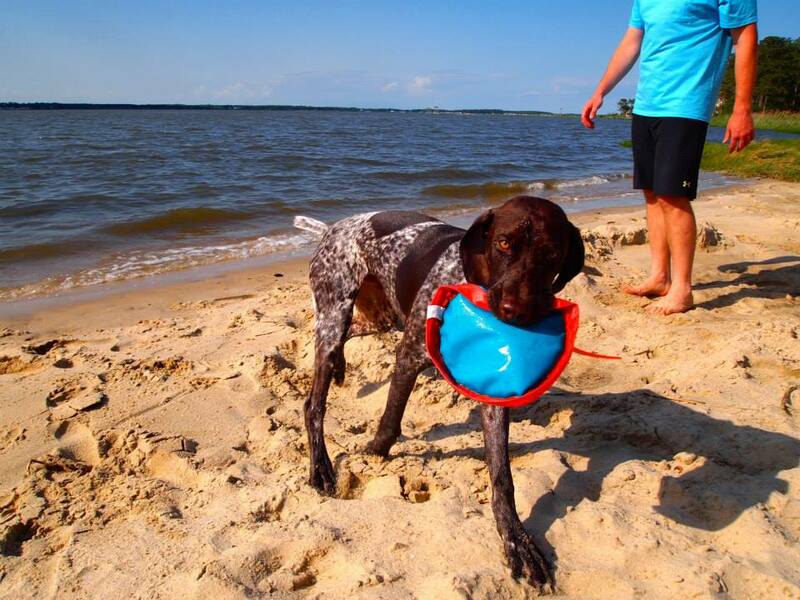 This entry was posted in Dog talk, Dog training, Karen Pryor Academy, Uncategorized and tagged clicker training a working dog, clicker training your gun dog, force-free training for dog sports, german shorthaired pointer, GSP, gun dog, hunting dog, positive gun dog training, sporting breeds. Bookmark the permalink. That’s a powerful statement in support of positive training. I love that last picture of Jackson with his intense, yet dreamy eyes. This is so cool! I’m so glad to hear his dad is so open to helping him learn and to work using force-free methods. You’re so great for taking a leap of faith to help them do this, and I can’t wait to hear more updates on Jackson’s progress. Excellent piece today Juliana. I am so impressed with what you are doing. Very proud of you, niece. 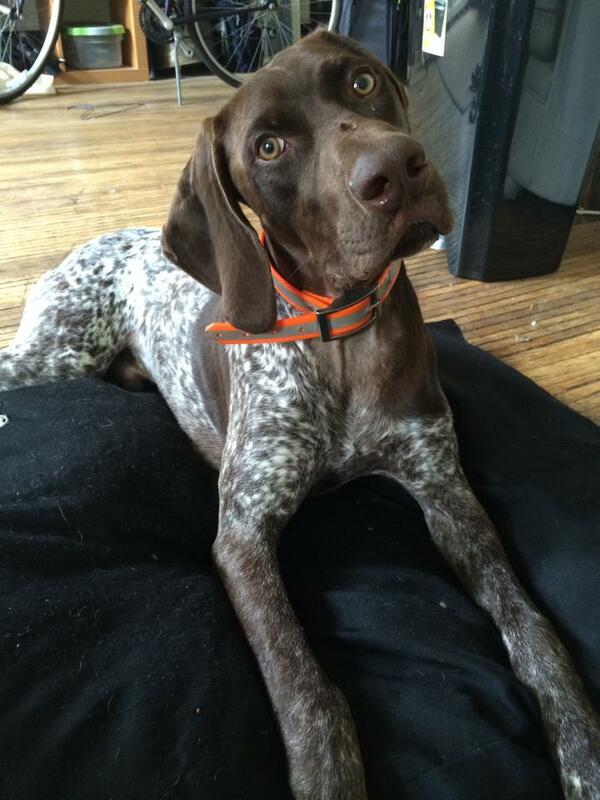 I rescued a Pointer who lost to a Mack truck :( but he was an amazing dog (who climbed my fence like butter). He learned very quickly and was so willing yet wanted to RUN so I understand the energy Jackson has. Hooray for you, Bryan, and Jackson! A friend of mine knows a woman who hunts her altered Coonhounds, winning in many a competition, then makes it clear they are ALTERED…HA. How is it going with Jackson?